Caramel corn is super duper delish. It's portable, it's addictive, it's crunchy, it's sweet and salty and just....YUM! But...ugh. It is a hassle to make! That is why this recipe is AWESOME! 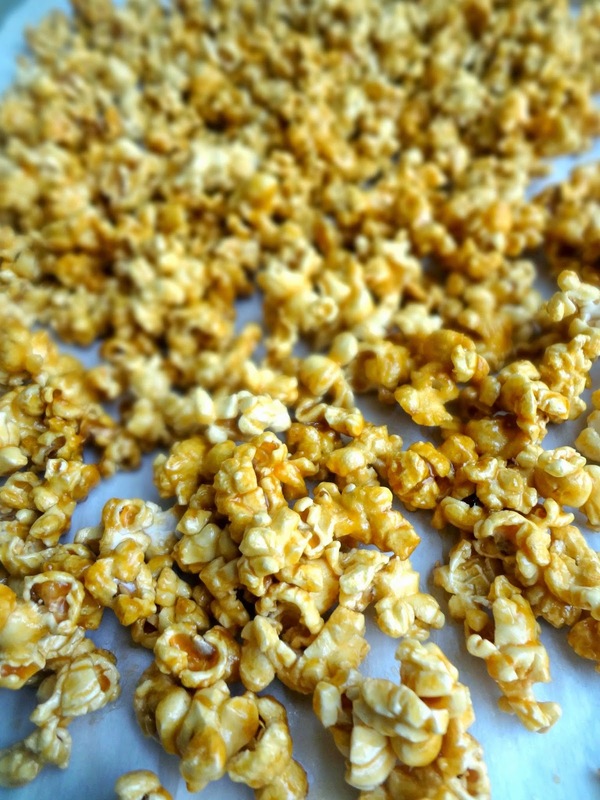 So much quicker and so much easier, it's a gift from the caramel corn gods! 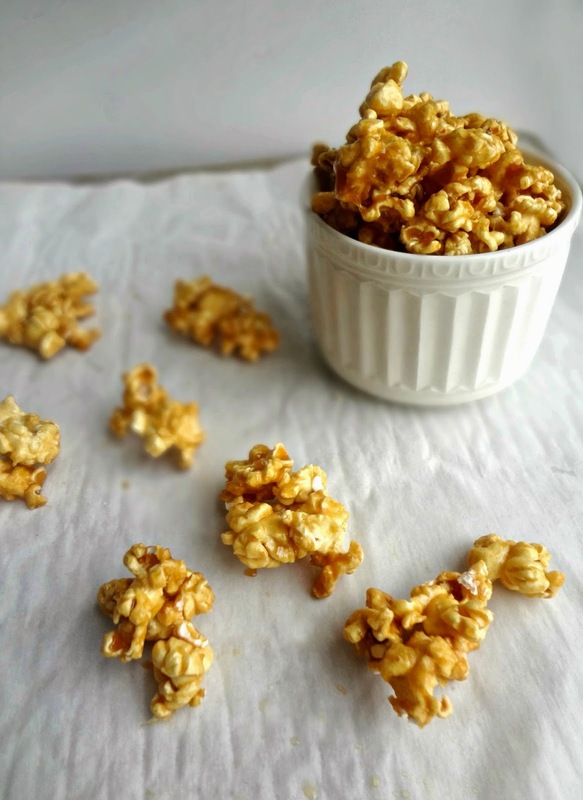 Hey-when you say "caramel corn" do people ever think you mean candy corn? This has been a mixup that's happened a couple times in my life recently. It's like...nono I know candy corn is awful. I'm talking about CARAMEL corn...you know...popcorn....coated in caramel. Like from the circus or a fair or just that super cute gourmet popcorn kiosk in the mall? Anyway. So. 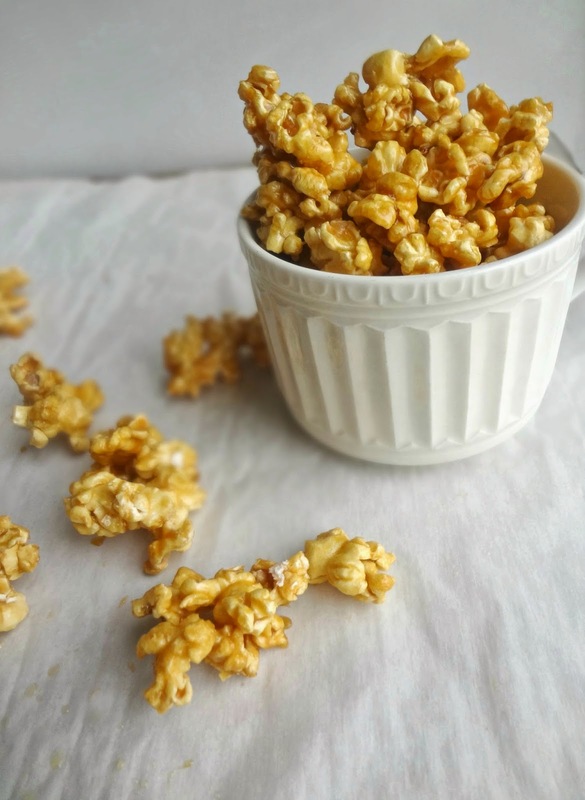 Here's what we've got: pop some popcorn in a brown bag (which we've talked about before), mix up some caramel in the microwave (surprisingly simple! ), then-now, prepare yourself, this COULD get messy, make sure your brown paper bag is sturdy!-you pour that caramel in the bag with the popcorn and shake it until it's all coated, THEN microwave, THEEEN shake it, THENTHENTHEN microwave it some more. Then shake it again. Then lay it out and let it cool and harden. TA-DAAAA (or, as the little girl I babysit says "DAAAAAA!") you have caramel corn!!! It's going to be crunchy, but still a little sticky (so be prepared to find delicious leftover morsels in your teeth for the next couple hours :P). And there you have it: simple! Gotta love a microwave. Pour the kernels in a large brown paper bag. Fold the top over and secure with a piece or two of tape. Place in the microwave on the bag's side (with the taped part facing up) and microwave for a couple minutes, until the popping slows down so you can count to 2 or 3 Mississippi's between pops. Take out and carefully open the bag. Remove any unpopped kernels. In a medium, microwave safe, bowl place the brown sugar, butter, corn syrup, and salt. Microwave on high for 2-3 minutes, until completely melted and bubbling. Stir. Immediately stir vanilla and baking soda into the sugar mixture. 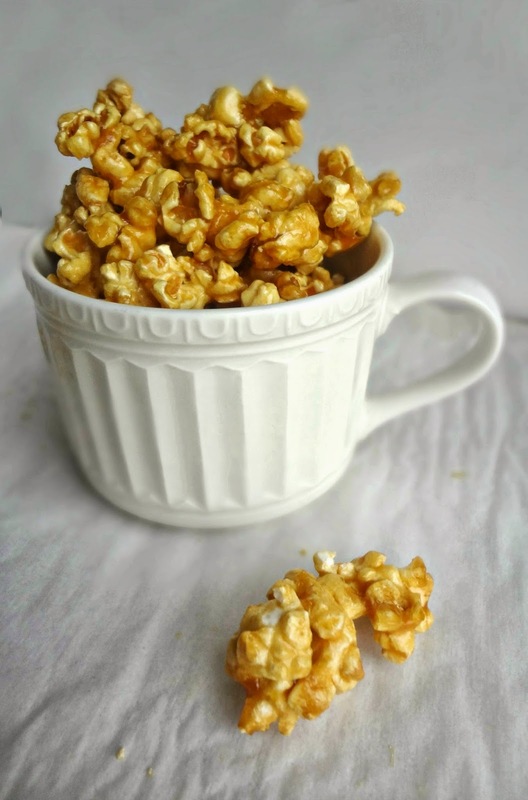 Pour the combined caramel over the popped popcorn in the brown paper bag-try to keep the caramel in the center, so it doesn't touch the sides of the bag. Fold the top of the bag over a couple times and then shake well to coat the popcorn. Microwave on high for 1 and 1/2 minutes. Remove bag and shake again. Microwave on high for an additional 1 and 1/2 minutes. 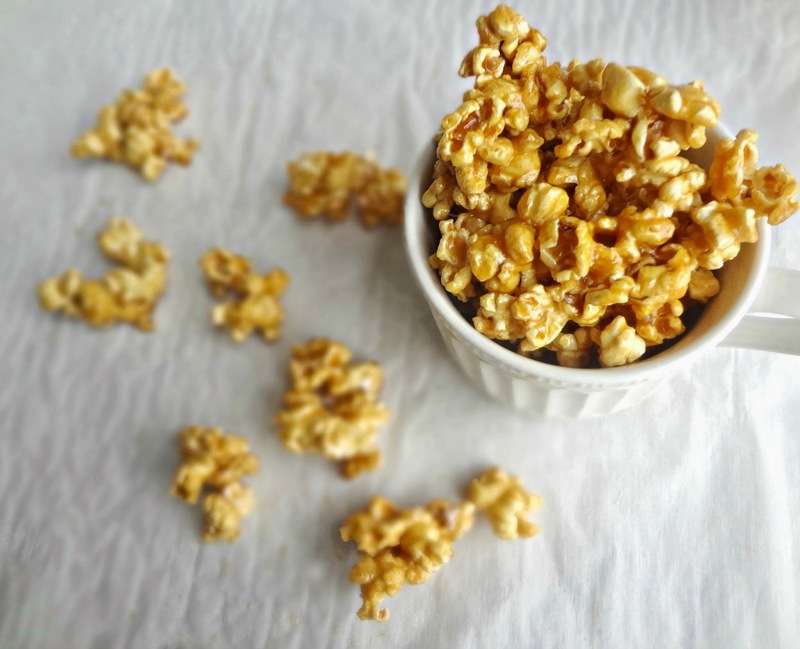 Pour popcorn onto a large, parchment or wax paper lined, baking sheet and allow to cool completely. mmmmwhaaa?ohhh *gulp* anyway, yeah, hope you guys make this caramel corn, see ya Wednesday!